The Palmer Woods Association is very pleased that so many new residents have moved into our neighborhood within the past year. It occurred to us, however, that some residents, whether new or established may not be familiar with the practices, standards and guidelines that have been in place in this neighborhood for many years. For this reason, the Palmer Woods Association Board has identified and developed a consolidated list of standards compiled from previously issued communications. 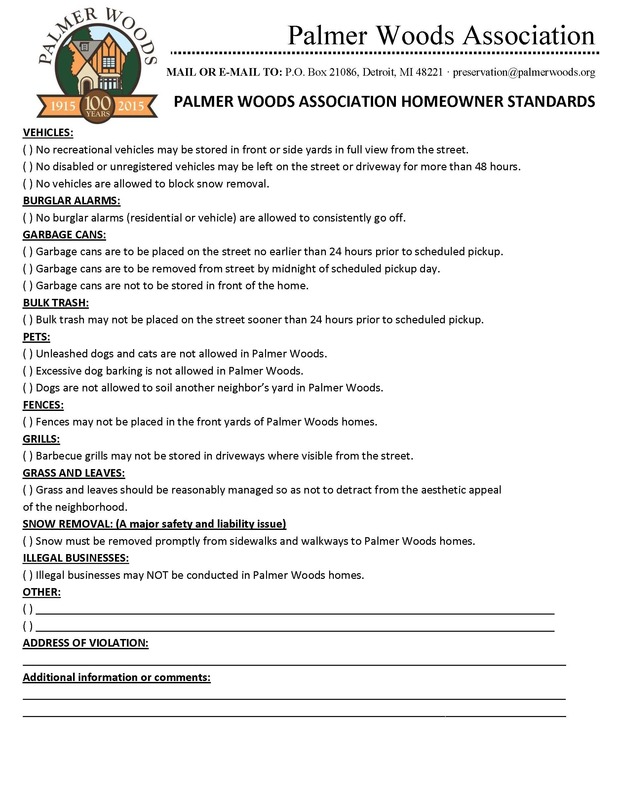 The attached document, entitled “Palmer Woods Association Homeowner Standards,” outlines these standards. Going forward, as Palmer Woods Board members are notified of deviations from these standards, a friendly letter will be sent to the applicable homeowner. We are confident that identified issues will be addressed promptly. If not, however, we will work with the homeowner and city to resolve the issue. The process is COMPLETELY ANONYMOUS. From that point, the Preservation Committee will handle the matter. Thanks in advance for helping to maintain the beauty, character and quality of life in Palmer Woods.